In 2016 Rosoboronexport (part of the Rostec State Corporation) will begin to promote the Uran-9 combat multipurpose robotic system in the international market. 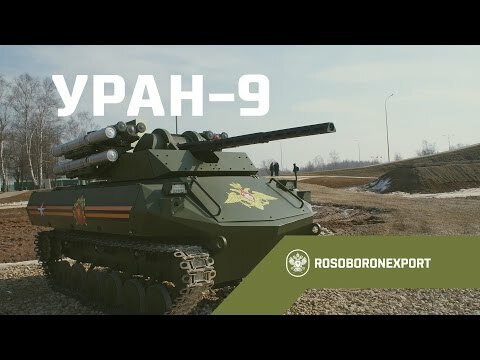 The Uran-9 is designed to provide remote reconnaissance and fire support to combined arms, recon and counter-terror units. It consists of two recon and fire support robots, a tractor for their transportation and a mobile control post. The armament of the recon and fire support robots includes the 30mm 2A72 automatic cannon, a coaxial 7.62mm machine gun and Ataka ATGMs. The armament mix may vary depending on customer requirements. The robots are fitted with a laser warning system and target detection, identification and tracking equipment. The Uran-9 will be particularly useful during local military and counter-terror operations, including those in cities. Its use will significantly reduce personnel casualties. “Russian developers possess all of the required competencies to create modern military robotics that will be in demand on the international market. This is a fast-growing segment of the arms market, so Rosoboronexport will develop and implement a long-term marketing strategy for promoting such pieces of hardware, including as part of integrated security projects,” said Boris Simakin who heads the Analysis and Long-Term Planning Department at Rosoboronexport.